Would you believe that I had never met her (now) husband!? Pretty crazy huh!? Well when you live 3000 miles away I guess that is what happens (unfortunately). So not only did I got to her wedding but I FINALLY met Matt! And in case you are wondering I give my approval! On Friday evening Steph and Matt hosted a get together at West 4th and Jane Santa Monica. 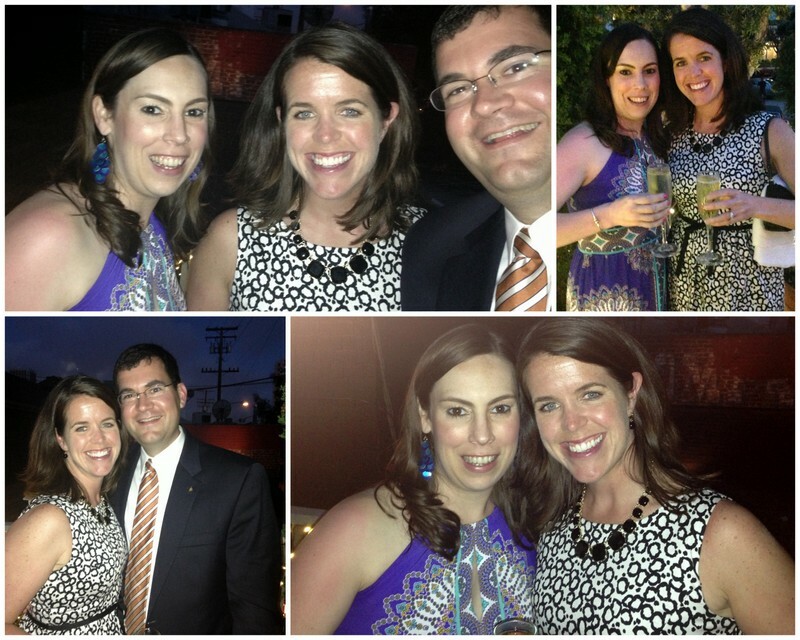 It was an informal event to give everyone the chance to hang out before the big day. 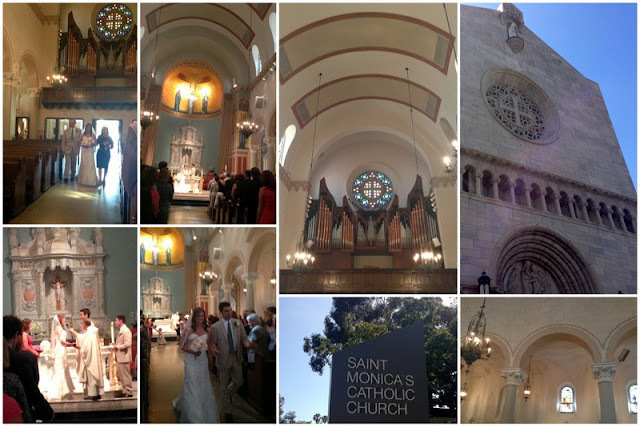 On Saturday the wedding ceremony was at 3:00 PM at the church where Steph and Matt go. St. Monica's also just so happens to be the same church where Tom Brady and Giselle got married! That is not why Steph picked this church. Ha! This church is gorgeous! The priest who married them was wonderful. He did such a nice job personalizing their wedding and he was so welcoming to all of us knowing pretty much everyone was from out of town! They kept things simple by having a small bridal party of just their siblings. I didn't get a picture of her sister's bridesmaid dress but it was so pretty! Outside of the church there were beautiful hydragea bushes. Love the colors. All the wedding guests gathered on the church front steps for a group photo. Can't wait to see how that comes out!! 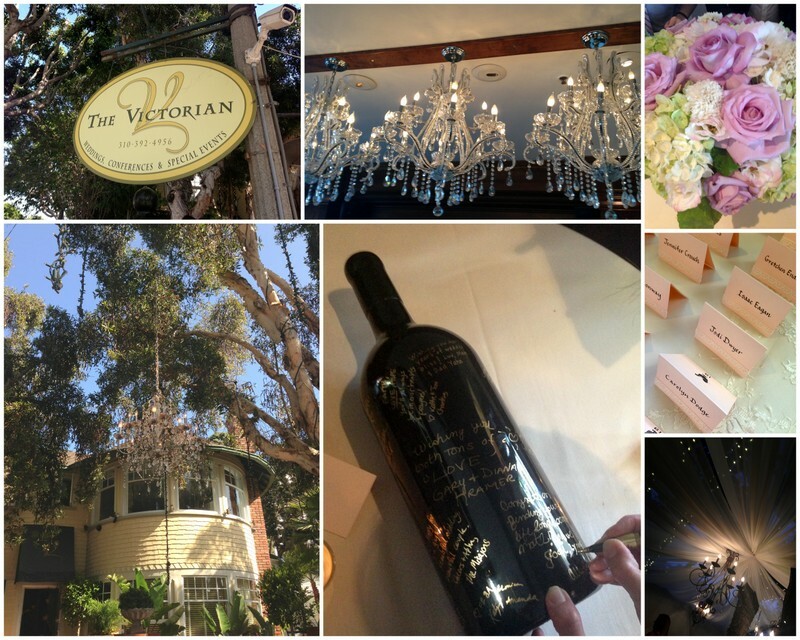 The reception was just down the road at The Victorian. This is such a lovely place to have a reception. Not on the ocean but so many other things that make it wonderful. We had the entire place to ourselves which is always so nice for a wedding. The cocktail hour was outside on the patio and the weather was so nice. We moved inside for dinner and then upstairs for dancing (and there was a great porch w/ comfy chairs for relaxing). The whole place just had so much charm. I can totally understand why they chose it! The food was delicious. I got the chicken (no surprise there since I don't eat steak or fish). Everyone at the table said there food was good too! 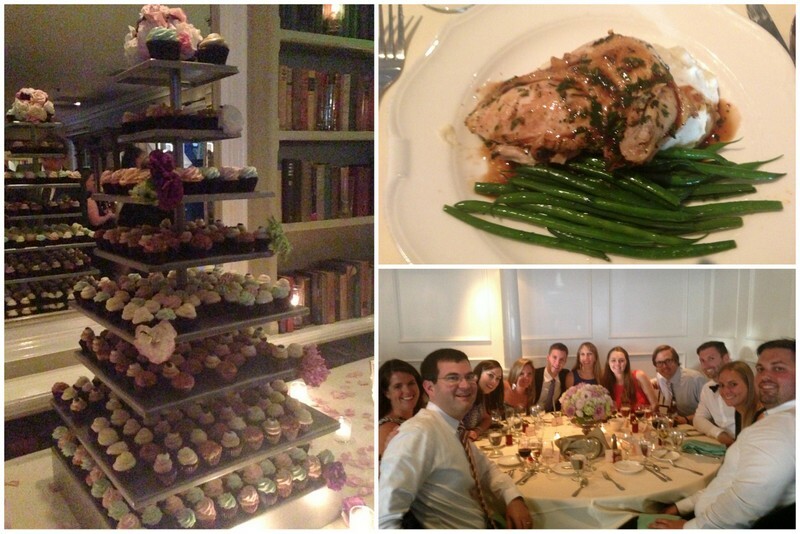 The wedding cake was actually a cupcake tower from Vanilla Bake Shop. There were several different flavors and since they were bite size you were allowed to eat 10, 5, 2! Stephanie looked BEAUTIFUL! I love her dress and it was so slimming and flattering on her. 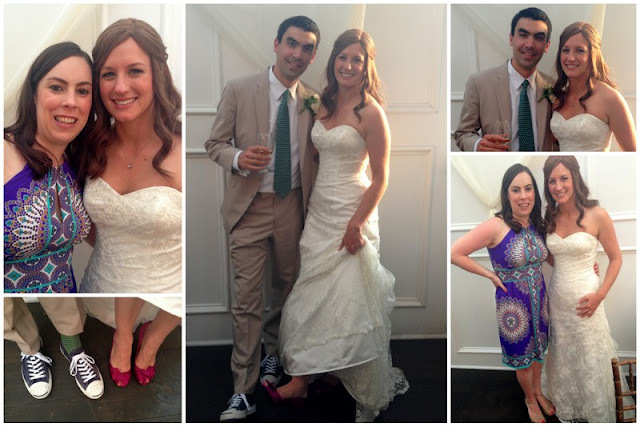 Oh and check out those shoes (on both of them)! Love that Steph chose a fun pop of color. Don't worry Matt changed his shoes into the sneakers after the church! Hmmmm. . . by this point of the night the champagne had been flowing. . . for a while! We hung out on the upstairs porch to check out the Super Moon! So pretty! 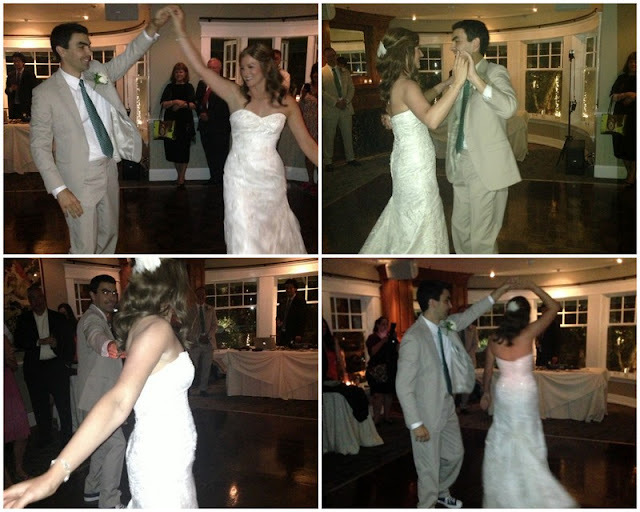 The happy couple took dance lessons and did a special dance for their first dance. So cute! I think they did a great job and Steph had a smile on her face the whole time. Too bad iPhone photos don't come out as well in low light but you get the idea! 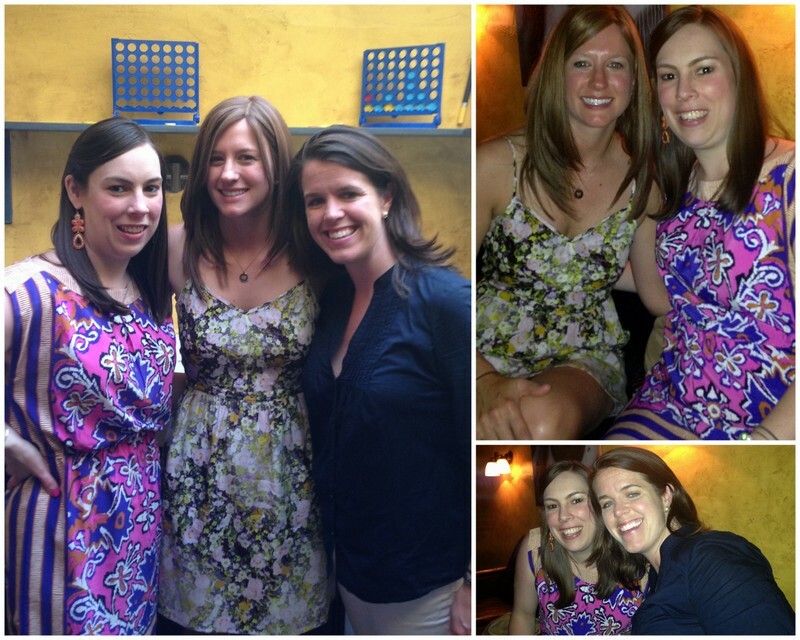 It was so fun to be hanging out with my former roomies. Lynne, Steph and I (oh and our honorary roomie Brian) had such a great time living together. 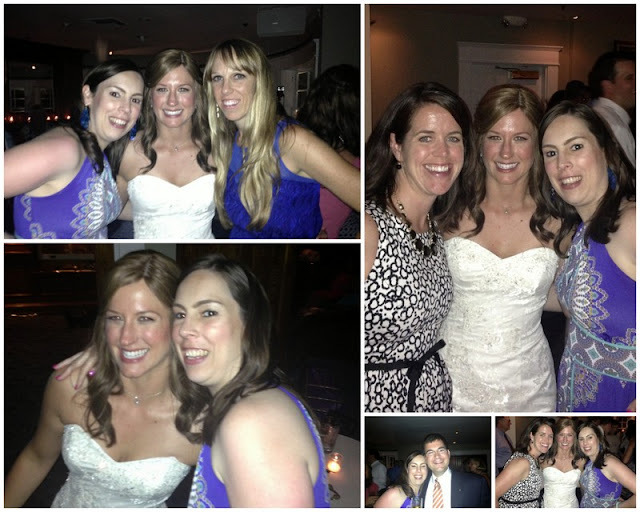 We shared some great laughs and had fun celebrating with Steph on her wedding day! 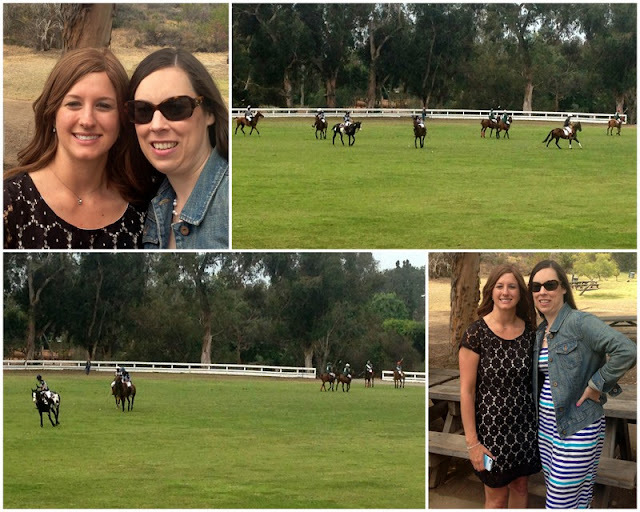 Sunday we attended an after wedding picnic at Will Rogers State Historic Park in Pacific Palisades. The biggest surprise to all of us. . . polo! Did you know people in the US actually play polo in real life? I sure didn't. 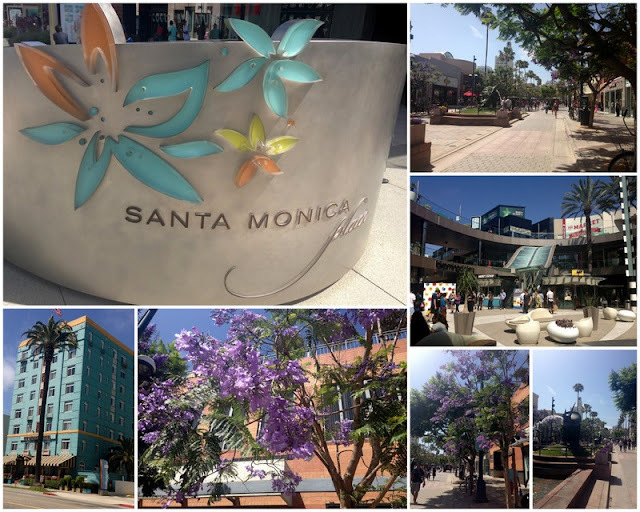 Then again I had never been to Pacific Palisades. It was fun watching it while we all hung out and talked about the wedding. After the picnic I had some time to kill before my redeye flight so I extended my time hanging out w/ Steph which was great. I went back to her apartment in LA and we chatted and caught up some more. It was a wondeful wedding and I loved seeing my good friend marry the man who makes her so happy. They've promised me a trip to Boston so I'm holding them to it. It will not be another 2.5 years w/o seeing each other!! Well hello there. I returned yesterday from a wonderful vacation in California. I went to see my good friend Stephanie get married but since I had previously lived in Long Beach it was also a chance to catch up with a few old friends and meet some new ones (bloggers)! I hope you enjoy my picture heavy post. Wedding post coming next. . . I arrived on Wednesday at lunch time and after a quick bite to eat with my friend Caroline and her kids she went back to work and we went to the beach! It took them about 2 seconds to get in the water. I on the other hand enjoyed the view from my towel on the beach! It was a GORGEOUS day! The temp was perfect and the sky was blue without a cloud in it. I was just happy to be on vacation in such a beautiful place! Is there anything better than palm trees? 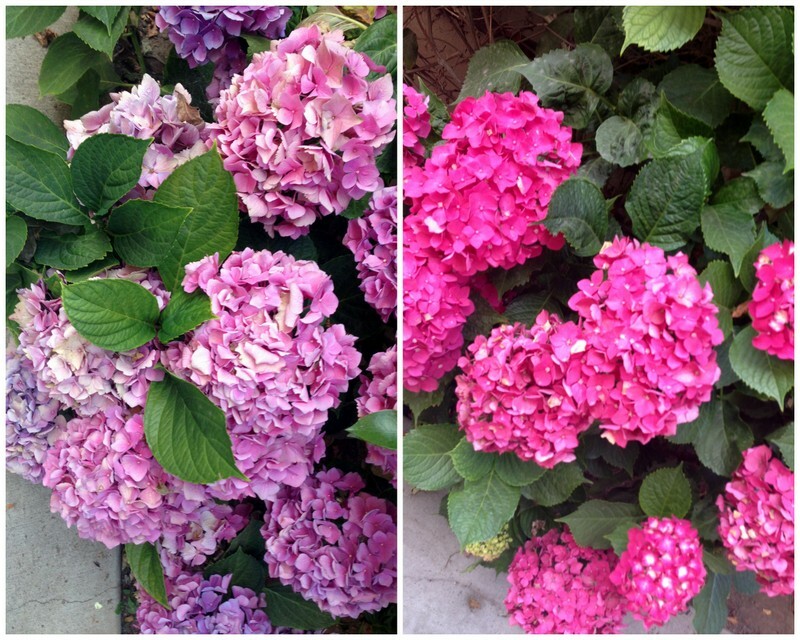 Maybe flowers?! 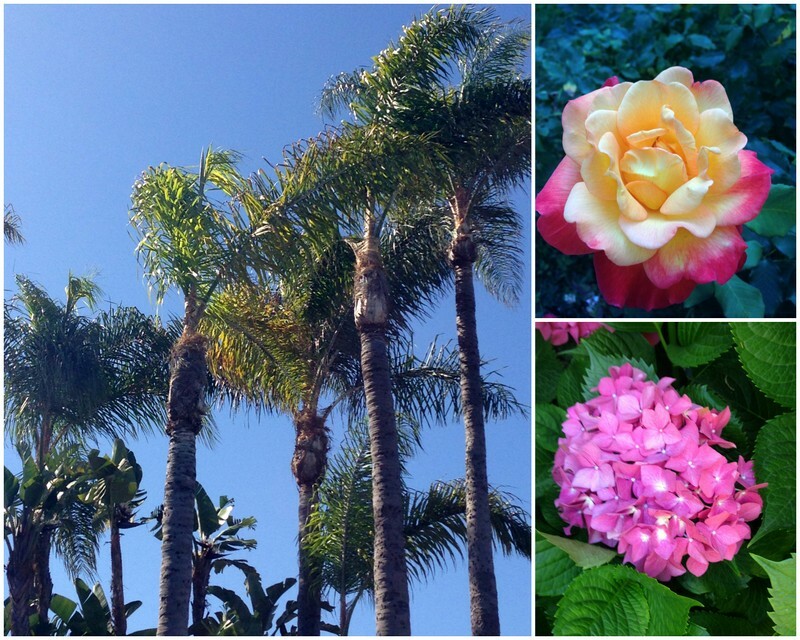 I just love how there are so many beautiful gardens in SoCal and I could stare at palm trees all day! We went to picked up my friend from work and then went home. We were discussing our evening plans when my friend got a terrible phone call from her mother (who lives in the Midwest). She was in the hospital and had just been told she had a brain tumor and needed emergency surgery. Needless to say my friend was devastated. We decided to stay local and walked to a restaurant so neither of us had to drive (clearly my friend needed a few drinks)! We sat outside and enjoyed yummy bar food and cocktails. On our walk home we decided we also needed ice cream. I love Cold Stone! It was really too bad since the main reason I went early was to spend time with her and her kids. Of course I totally understood and supported her decision to go. Hopefully I'll get back to see her soon (or she'll bring the kids for a trip to Boston)! Pray for her mom who will start radiation soon. She has already beat lung cancer so hopefully she can beat this too! I gave all 3 kids a Boston Strong shirt. Unfortunately Andy had already left for his friend's house so I didn't get a picture of him! Thursday morning I went to the Diana exhibit at the Queen Mary in Long Beach. I had seen it advertised the night before and knew I had to check it out while I was in town. It was really cool but they wouldn't let you take pictures inside which was a disappointment since there were SO many beautiful dresses (shhh don't tell that I took 2)! You can see more of the dresses and other items here. 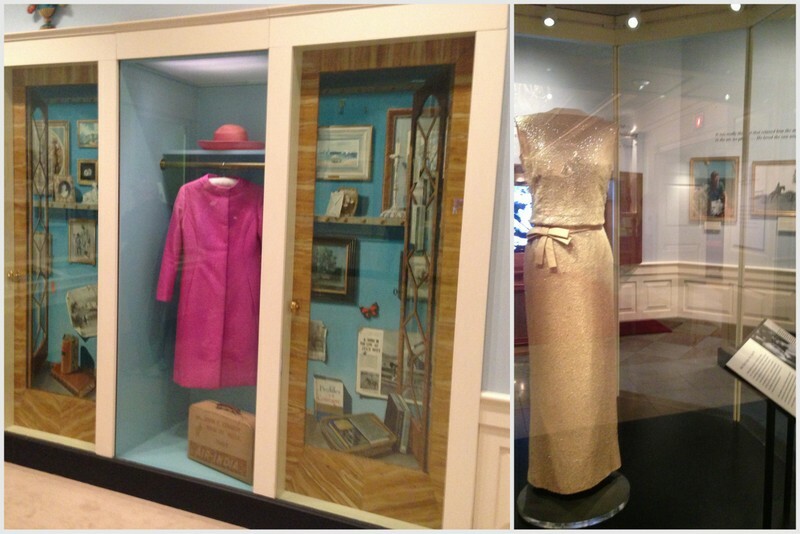 They had many other displays from other royal family members and even had a entire section for William and Kate including her engagement dress! I had a very short time to visit due to other plans so went through quickly. 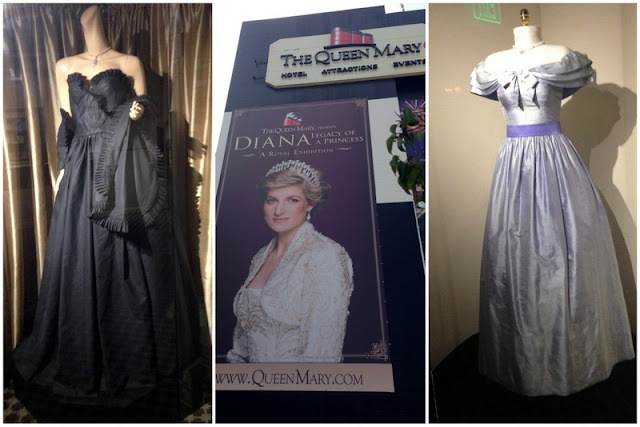 It was worth seeing but I think it was overpriced ($30 for entrance to the Queen Mary and Diana exhibit as you couldn't just purchase a ticket to see the Diana exhibit). I had previously been on the Queen Mary back when I lived in Long Beach but I figured since I paid all that money for the Diana exhibit I would walk around the ship a little bit too. I didn't have a digital camera back in the day when I lived there so it was nice to take some new pictures! 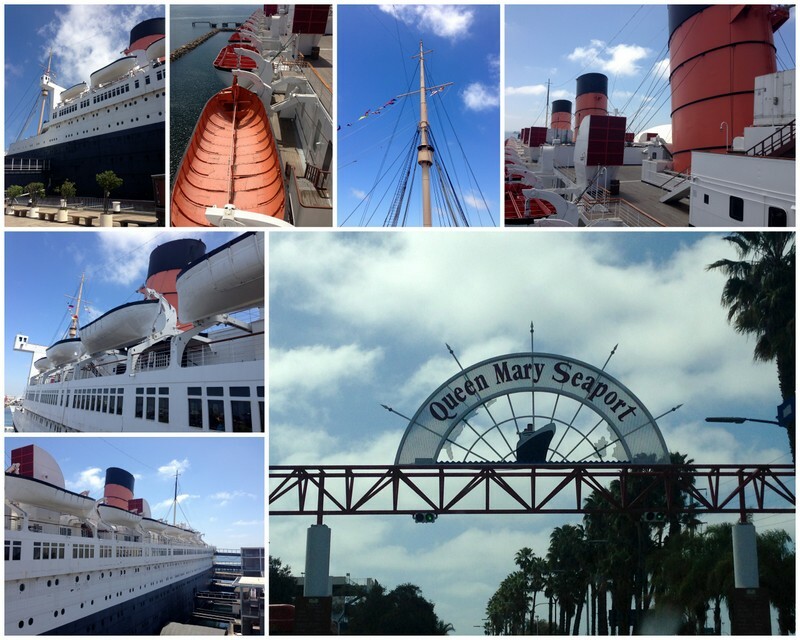 The Queen Mary made her maiden voyage on May 27, 1963 from England across the Atlantic Ocean. This was the way the rich and famous traveled! During WWII the ship was used to transport troops and after the went went back to being a cruise ship for two more decades. 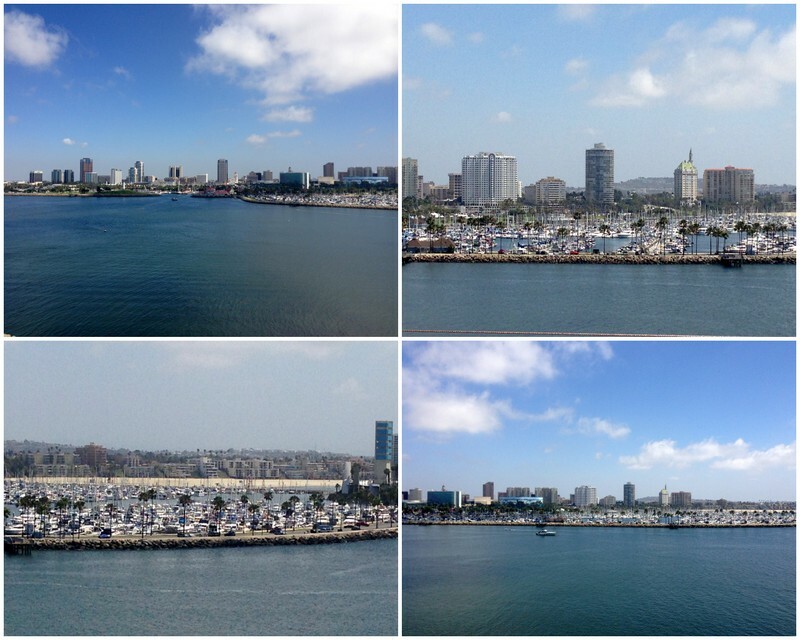 In 1967 she arrived in Long Beach and has called it home ever since. It is now a hotel and used for functions. It is also said to be the "haunted ship" with plenty of ghosts aboard! The views from the upper deck are beautiful. You can see for miles! More views of downtown Long Beach from the Queen Mary. By the way it was another fabulous day! 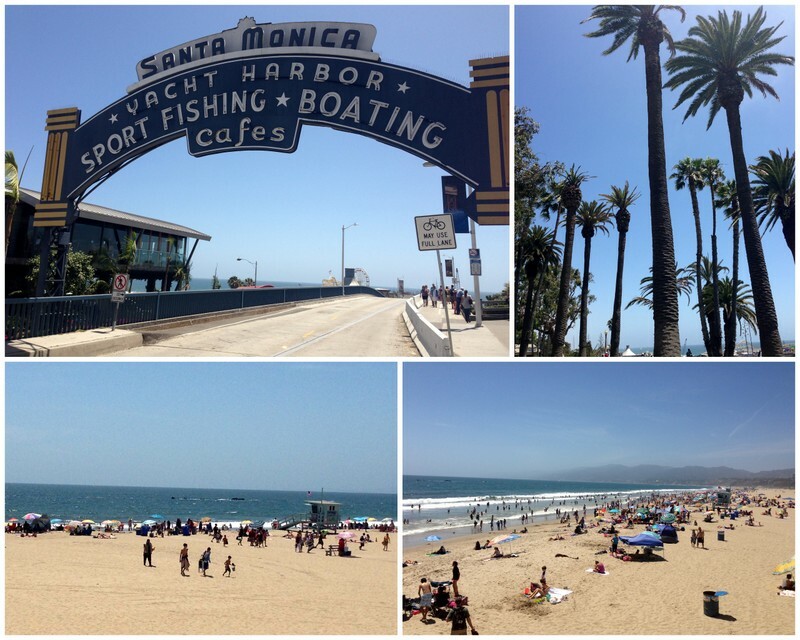 No June gloom here!! 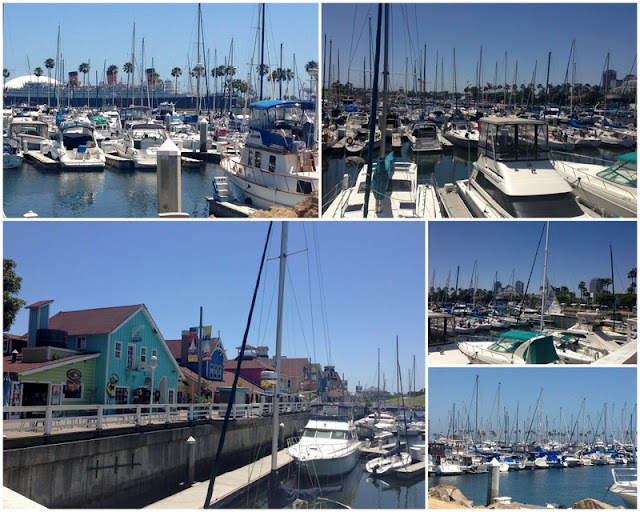 After my adventures on the Queen Mary I went to visit my friends Art and Evelyn. They are the sweetest couple around and I always make time for them when I'm in SoCal. 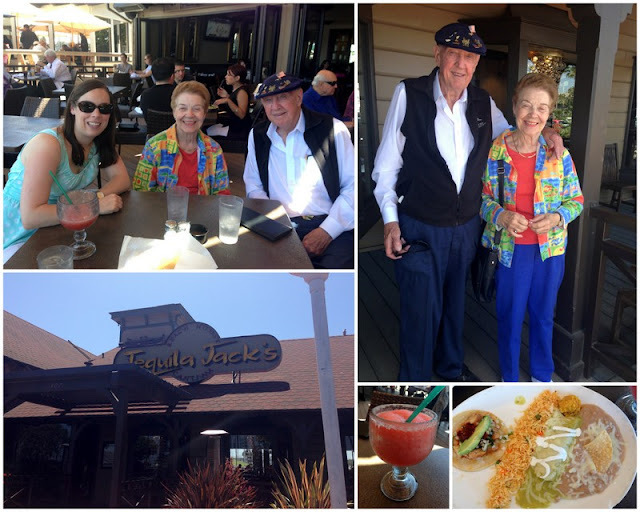 We went to lunch at one of my old favorites, Tequila Jack's, in Shoreline Village. We had a delicious lunch and I of course had to get a margarita. Oh and Art and Evelyn just happened to be celebrating their 55th wedding anniversary!!!! We sat on the back patio and these are the views we enjoyed during lunch! This is why I love this place - not only are the food and drinks great but the view in priceless! We had such a nice time catching up. 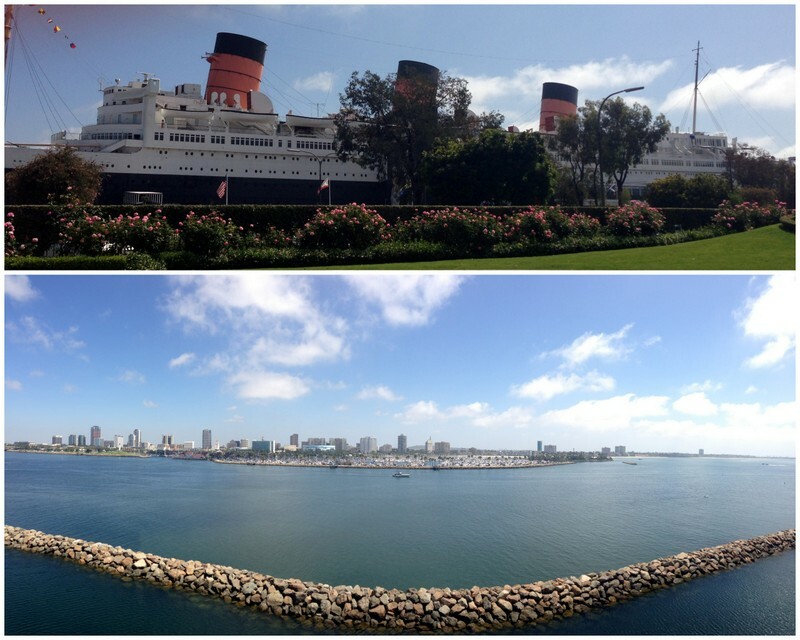 In the top left picture you can see a view of the Queen Mary from the other side! Thursday night I went to Hollywood for a blate (blogger date) with some of my favorite SoCal bloggers. Leeann had suggested we do some sightseeing prior to meeting up for dinner. 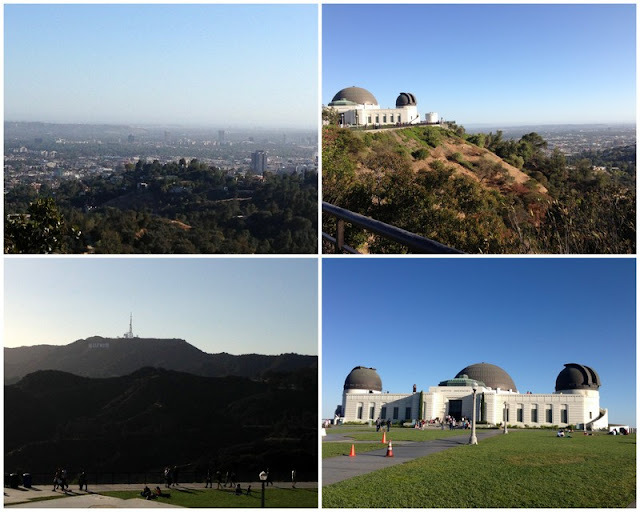 She took me to Griffith Observatory since I had never been there. Kat joined us too! 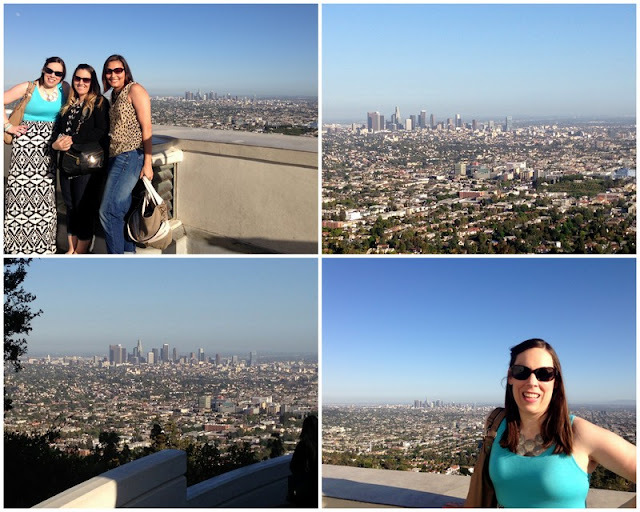 We saw a great view of downtown LA but unfortunately due to the location of the sun we couldn't get that great of a view of the Hollywood sign. If you've never been up there I highly recommend it. You can see all the way to the ocean on a clear day! Oh but be warned the drive up in on a very curvy road so if you get motion sickness beware! 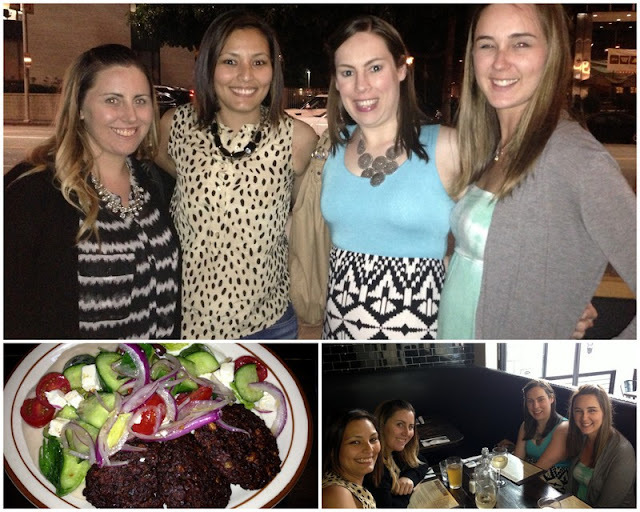 Leeann, Kat, me and Amy (top picture) enjoyed a great dinner at The Bowery in Hollywood. It is a small place and we sat at a table near the open windows which was really nice. They are known for their burgers which the other three ladies all ordered. I don't eat burgers so I got the Green Lentil Falafel and it was surprisingly good. When it first came out I was afraid it was burnt but it wasn't and I really liked it. I also really liked the company. It was so fun getting to know these ladies better. It will make reading their blogs even better. 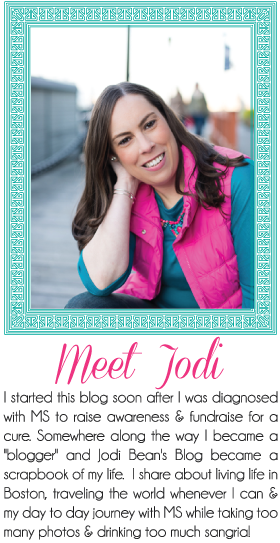 If you don't know their blogs you should check them out! 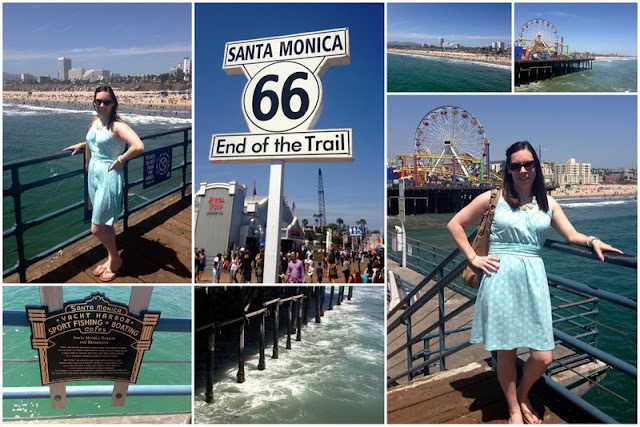 On Friday I went to Santa Monica for some sightseeing and to meet up with friends who had flown in from Boston that morning (they were also attending the wedding). In case you hadn't noticed it was ANOTHER gorgeous day! Ha! But really it was. Sightseeing on the Santa Monica Pier is a must! The people watching is great! 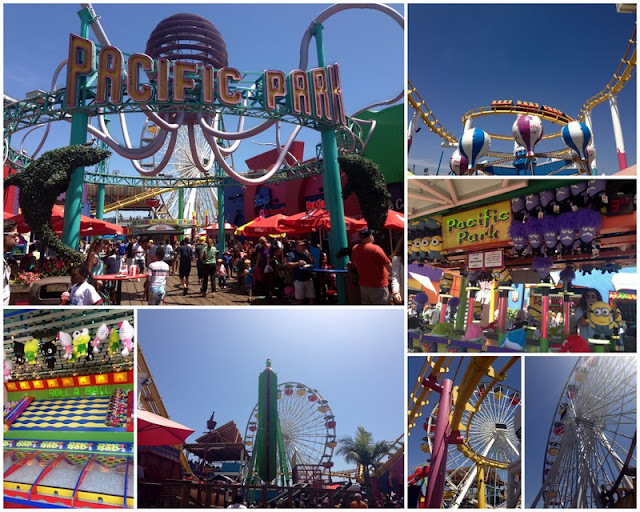 There are plenty of rides, carnival games and yummy food all while seeing a beautiful view of the beach and ocean! Lynne and Brian took a ride on the roller coaster. I'm not a fan of those so I just enjoyed the view! After the Pier I enjoyed relaxing at their hotel pool prior to a walk around the 3rd Street Promenade. It is basically a shopping area and the street is closed to cars. It is very pretty! We kept on walking to 4th Street to meet up with the bride and groom. You'll have to wait to read about that in the upcoming wedding post! I also got to have breakfast with Amanda from Sweet Tea Paperie. It was so nice to catch up with her in person. I gave her a gold anchor and Ani bracelet as a thank you for designing The Bean Team logo. I love chatting with Amanda b/c we can discuss all things social media and blogging but then we can also discuss our professional lives since we have similar masters degrees. It is so nice to chat with someone who "gets it" since my job can be stressful and often unbelievable! I only wish she hadn't left Boston!! All in all it was a great time despite the rocky start. 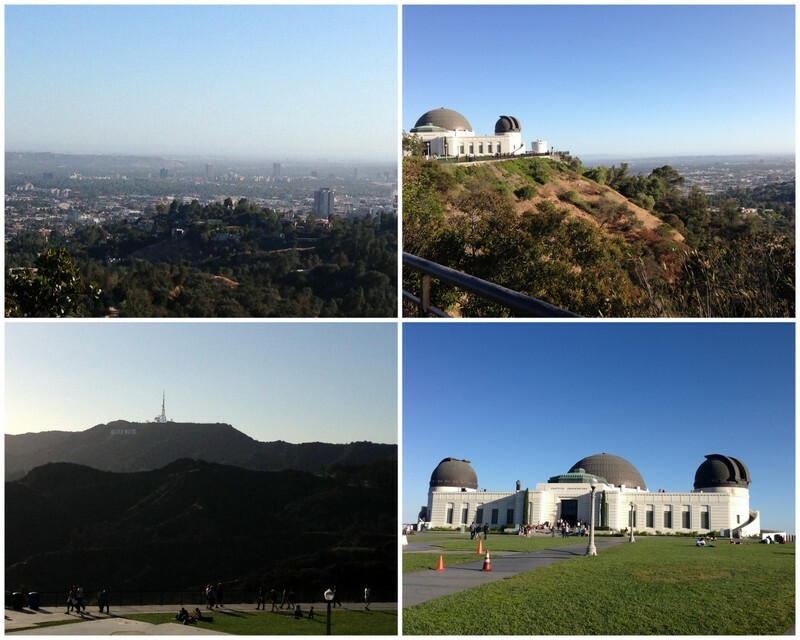 I enjoyed great weather and plenty of sightseeing and relaxing! Can I go back now?! 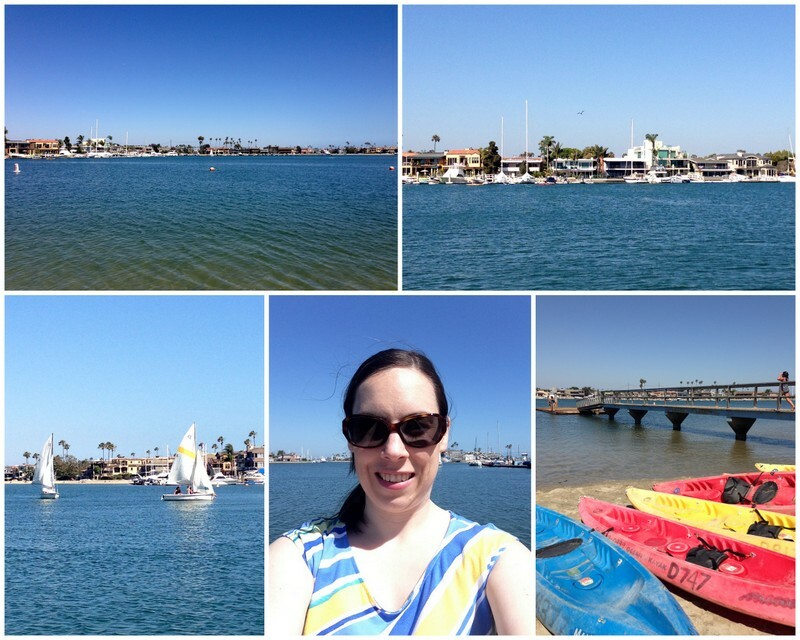 And then we finally get to the final recap of my Staycation! I really can't believe how long it has taken me to get 4 days posted on the blog. I've just been crazy busy with work and life! I can assure you that Day 4 was worth the wait. 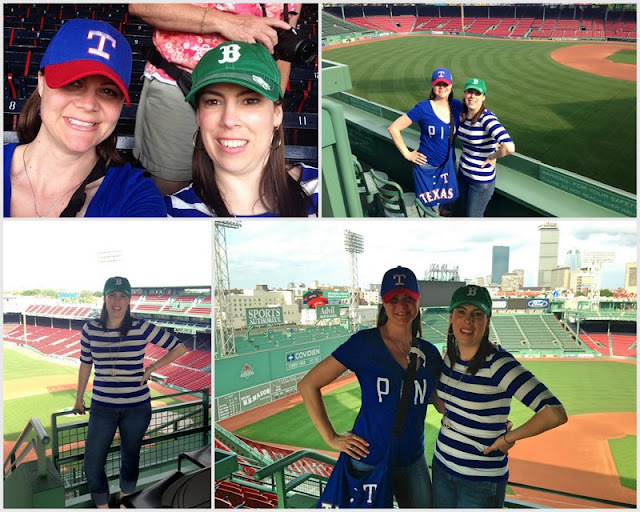 Today I'm telling you all about when Rachel and I went to Newport and then the Red Sox/Rangers game! Make sure to read my posts about Day 1, Day 2 and Day 3 as well especially if you are planning a trip to Boston! As I had mentioned in my previous post, Rachel and I had planned to go to Newport the previous day but it was raining. So we reorganized and made it work for her last full day in town. The only problem was we also had tickets to the Red Sox/Rangers game that night so it limited the time we could spend in Newport. Newport is 1 1/2 hours away so we got on the road at 9AM (hoping it would be right after rush hour) and we made great time getting there. Our first stop was at one of the famous Newport Mansions, The Breakers. 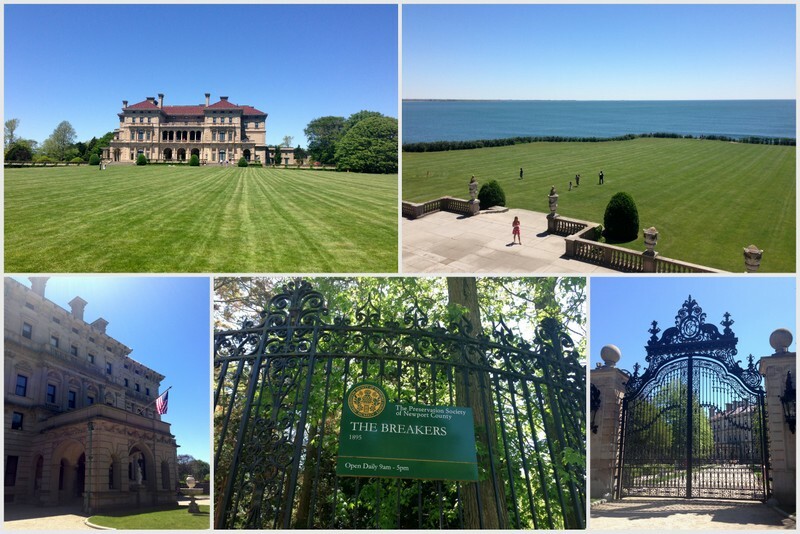 The Breakers is the most famous of all the Newport Mansions and I'm sure you can tell from the pictures why. . . it is GORGEOUS! We bought the "package" for The Breakers + One for $24.50. 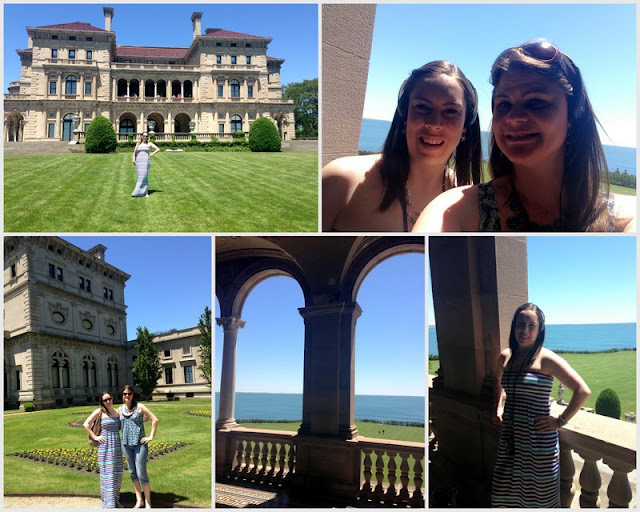 That meant we could pick one other mansion to visit - pretty good deal. You do a self guided audio tour (see headphones and thing around our neck). 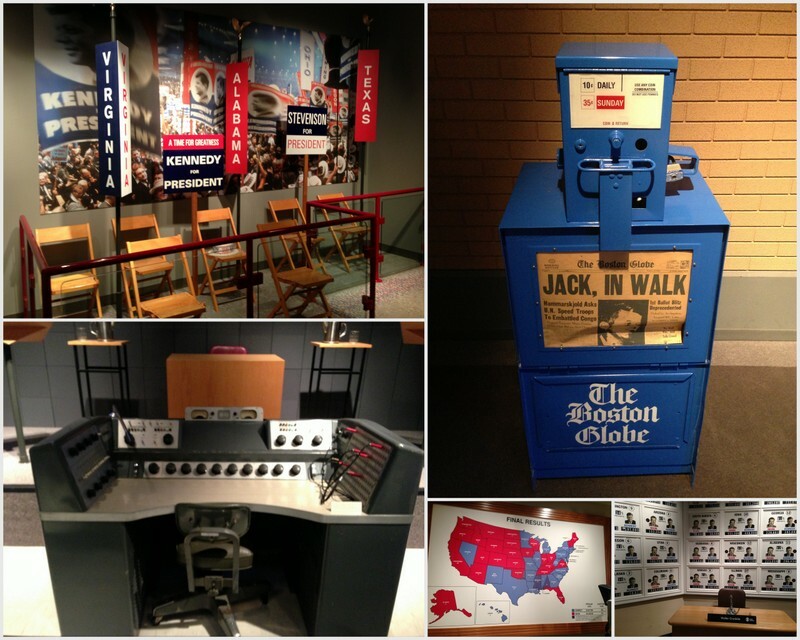 The audio tour was REALLY good! I liked it a lot. It gave you the basics/overview and then also gave you options to hear more detail if you wanted by pressing certain numbers. I can't even begin to describe to you the "fabulousness" that is this house summer cottage mansion! It is amazing. The inside is so beautiful and reminds we a lot of places I've only seen in Europe. 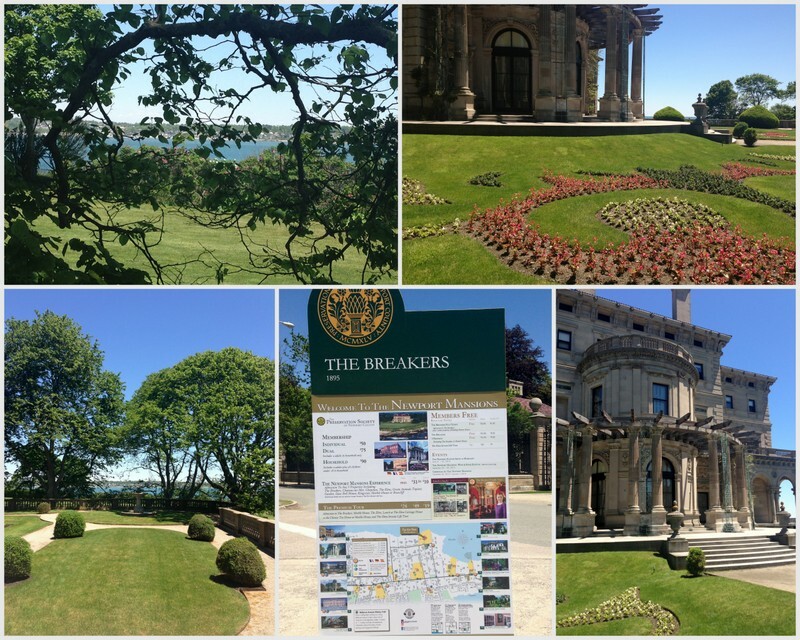 The Breakers was The Vanderbilt's summer "cottage" even though it has 70 rooms! 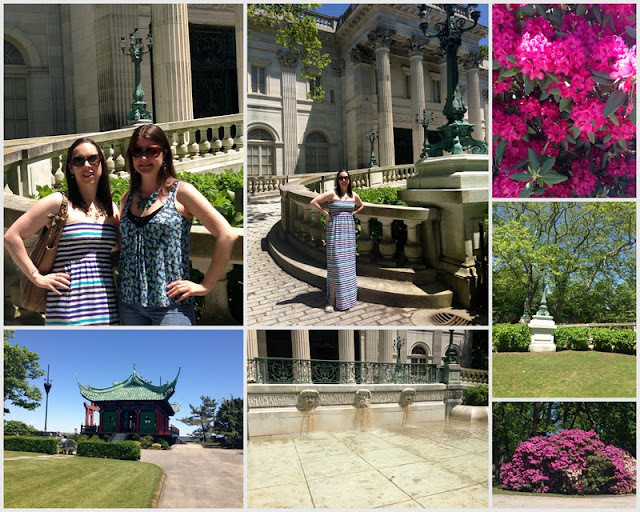 It was built in 1893 for The Vanderbilt's to enjoy with their seven children. Oh and the views are AMAZING! In 1972 The Preservation Society bought the home from The Vanderbilt heirs and the house is now designated a National Historic Landmark. This is a must-see if you are ever in/near Newport. It is like nothing else I've seen in the USA! 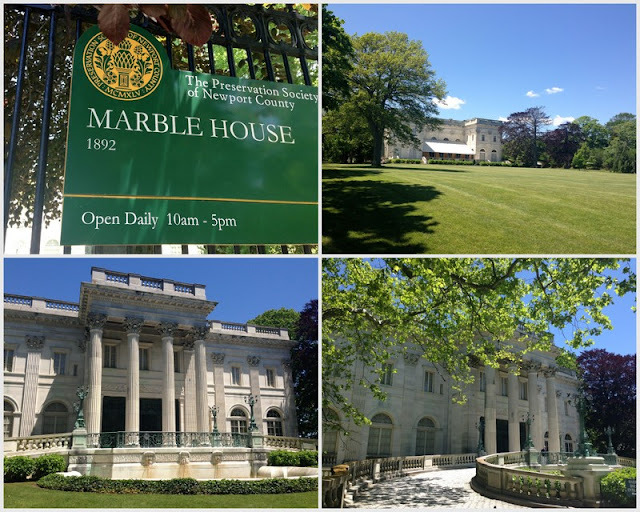 For our 2nd mansion we chose to visit The Marble House based on a few friends' recommendations. This house was owned by "the other" Vanderbilt's, brother to the owner of The Breakers. Lucky family! This home was built between 1888 and 1892 (prior to The Breakers actually)! This house was a gift to the wife, Alva, from her husband, for her 39th birthday. Nice gift! They had three children and ended up divorcing in 1895. Then Alva married some other rich guy and moved down the street into one of the other mansions, The Belcourt. I can't make this stuff up. There was scandal even back then!! The Preservation Society acquired this house in 1963 and in 2006 it was designated a National Historic Landmark. While The Marble House isn't as big as The Breakers it is still amazing. Again we had a self-guided audio tour which was very interesting! We drove by the other mansions and they are all beautiful. I hope to visit some of the others in the near future. 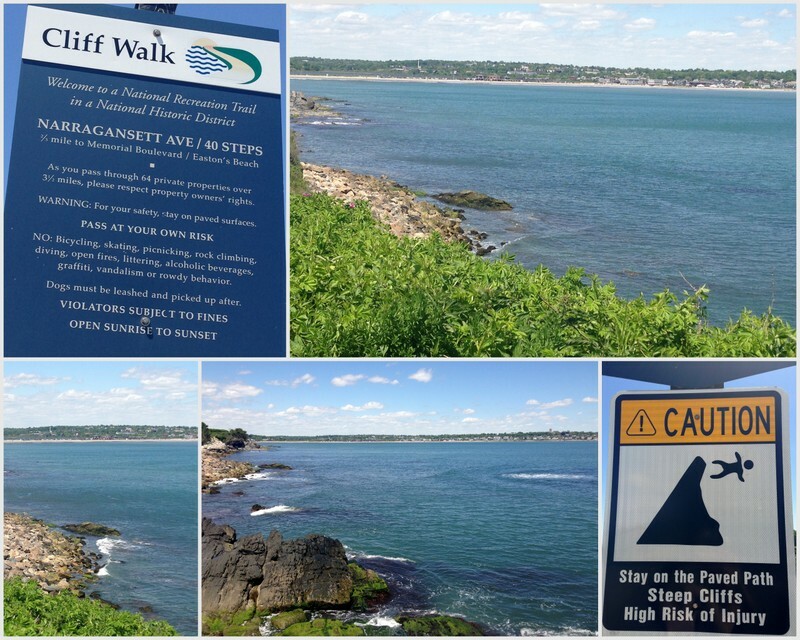 Our next stop was at the Cliff Walk. This is a 3.5 mile walk along the ocean and you can also see many of the Newport Mansions along with other private homes. 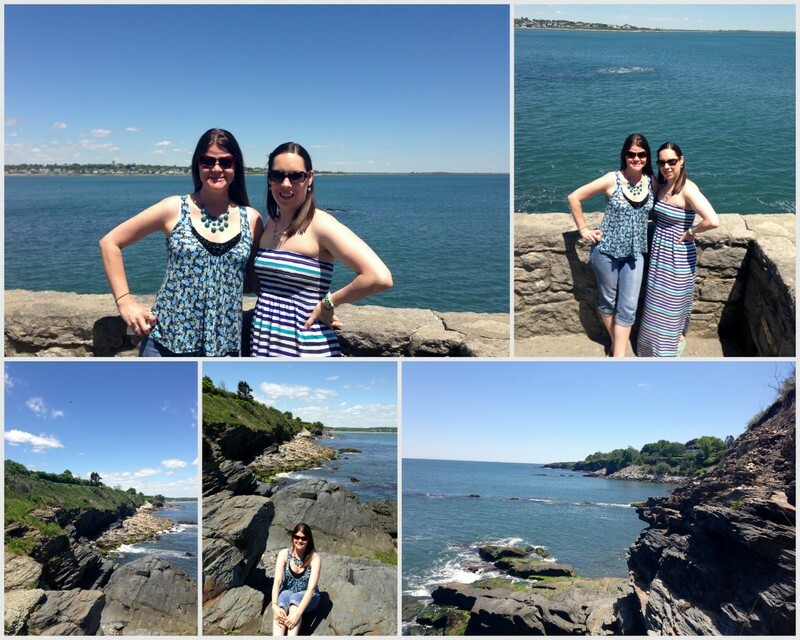 Could we have been in Newport on a MORE gorgeous day!? (The answer is no in case you are wondering)! It seriously was a "top 10" day in my book. The temp was perfect and the sky was so blue with perfectly place fluffy clouds. We enjoyed soaking up the views and the sun for a little while. We made sure to get plenty of pictures. Rachel loved seeing the Atlantic Ocean and couldn't get over how blue it was! The best part of being at a tourist attraction on a pre-peak season and a non-weekend day is no crowds. We had the whole place to ourselves. The mansions were hardly crowded and the Cliff Walk only had a few other people checking it out. I love feeling like you have a place to yourself. We ended our day downtown with lunch and window shopping. Again, due to no crowds we had no problem getting a table outside on the water with no wait. We soaked up some more sun and ate more french fries (not sure if you have noticed but I ate a lot of fries while Rachel was in town)! 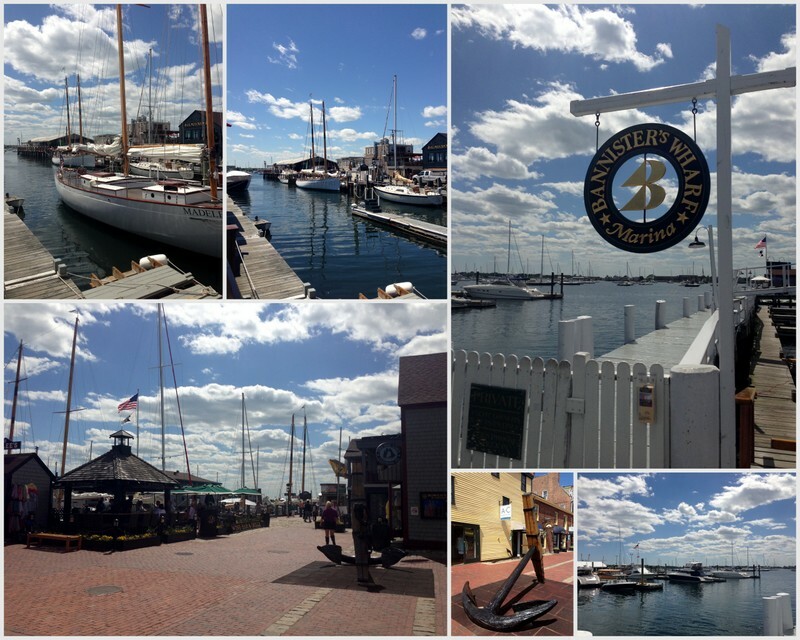 After eating we walked around the harbor and enjoyed all the views. They photos are unedited (except for cropping). The day was so pretty! I loved window shopping since I will never be able to afford the prices in Newport! All the stores were a little pricey! We cruised back to Boston and quickly changed into our game clothes. We hopped on the bus to head down to Fenway. On the bus ride I took a selfie (bottom right picture) and posted it on IG saying "enemies tonight." Of course I was kidding kind of! I'm not one of those sports fans who can't be friends with people just because they cheer for another team unless of course we are talking about a Yankees fan. 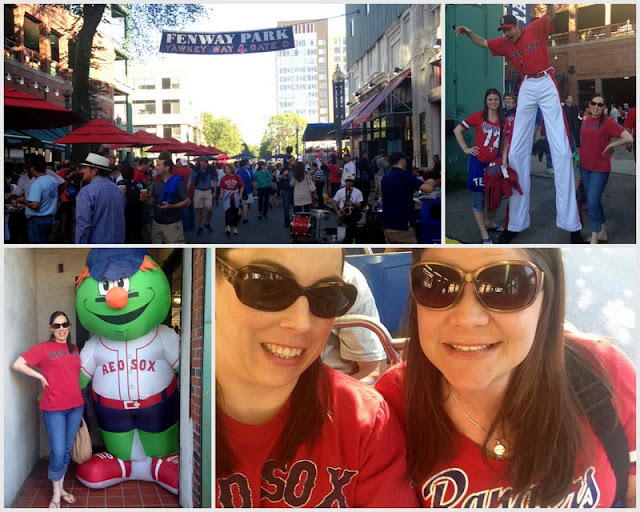 Rachel and I wanted to get to the game a little early so we could hang out on Yawkey Way. It is the street along one side of Fenway that is closed and you can only go in if you have tickets to the game. They sell food and beer and a lot of other fun stuff is going on. It is a great scene! I hardly took any pictures once inside for the game since we took so many the previous day during the tour. But there was a picture worthy moment for Rachel. . . she got a ball. . . not any ball though. A Rangers player hit a home run right to where we were sitting and the guy in front of us who got it (a Red Sox fan) gave it to Rachel. She was so excited! I still can't believe a home run ball came to our area. I'm just glad it didn't smack me in the face! Oh and just in case you were wondering. . . the Red Sox WON! Not only did they win but they did so by a lot. 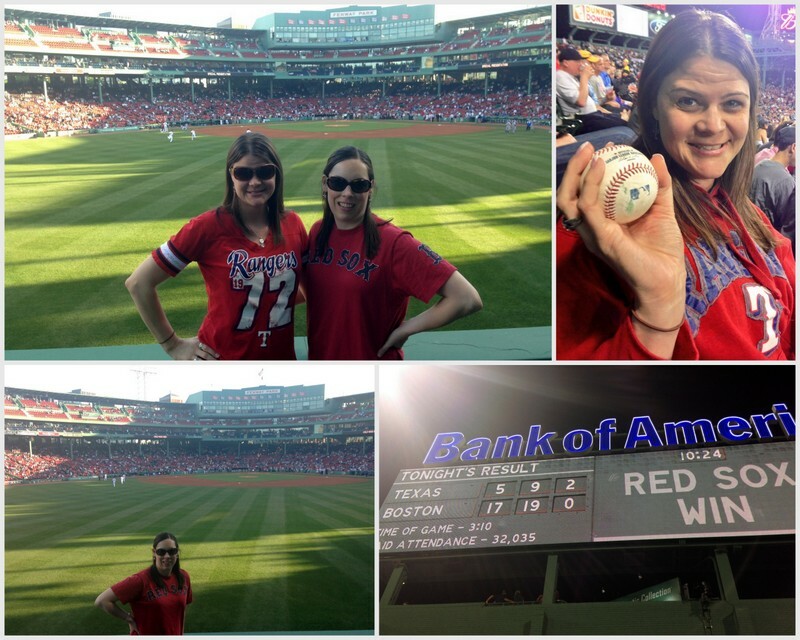 I'm just glad Rachel is a good sport and had a blast at Fenway despite her team losing. At least she got a ball. The next day I had to go back to reality work and Rachel had to head to the airport. We had such a great 4 days and managed to see and do SO much! 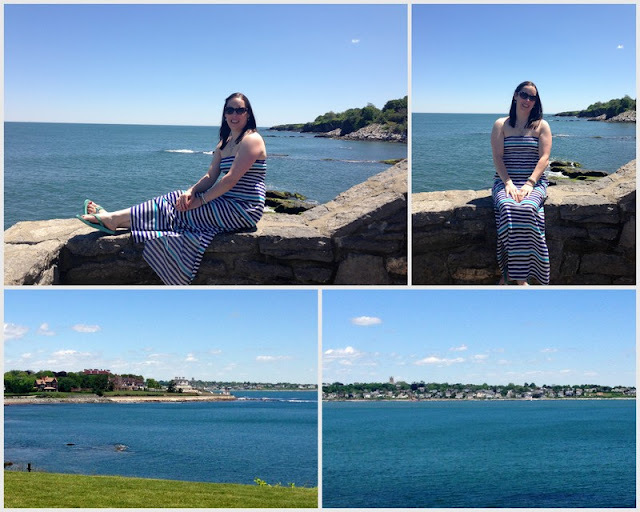 I loved having a Staycation in Boston. I was able to do things I've never done and I've lived here most of my life (except for college in NC and 1 year in CA). 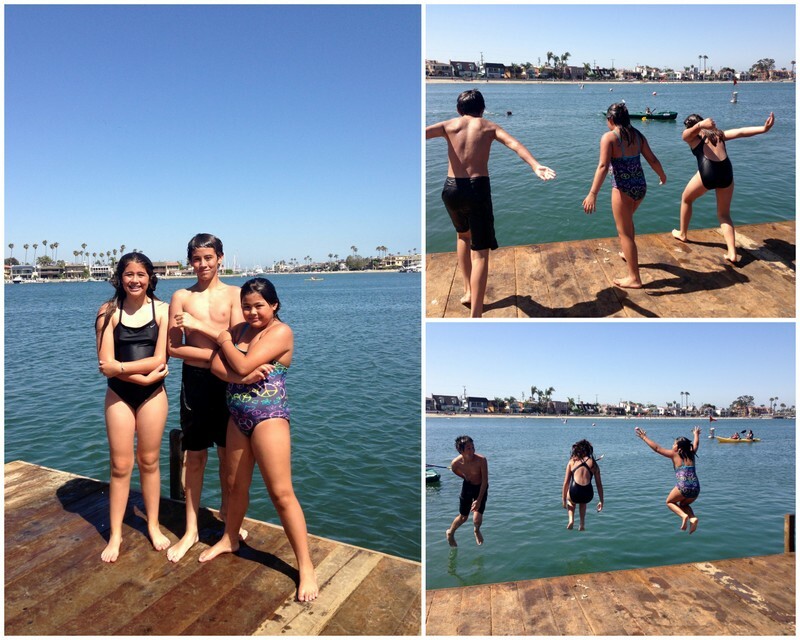 It was a great kickoff to my summer. For those of you who have asked/wondered. . . Rachel and I did meet through blogging. 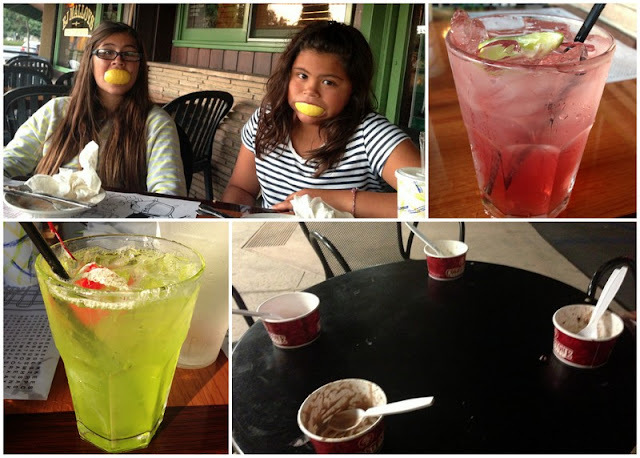 This was our 3rd blate (blogger + date). 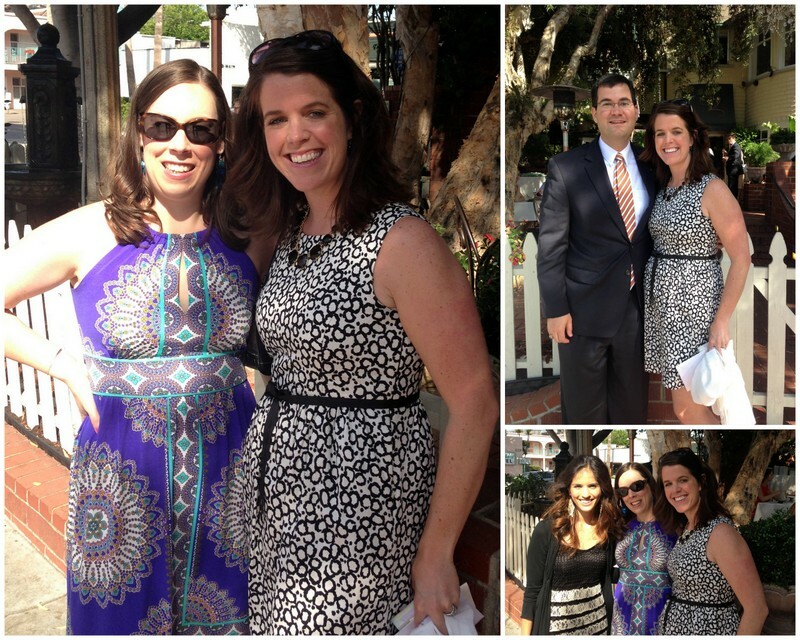 We met in November 2012 at Katie's wedding and then saw each other when I was in TX for Blissdom in March 2013. Rachel and I have several differences (where we live, political views, religious views, etc). But for all our differences we have just as many if not more things in common. 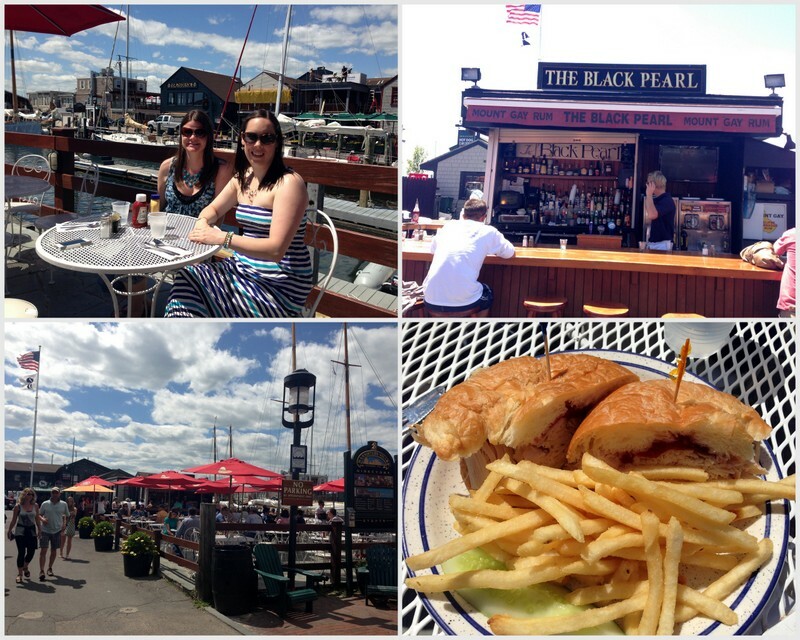 We had a wonderful time exploring Boston and beyond and it was so fun to get to know Rachel even better. She has become a great friend (all thanks to blogging)! WHAT WAS YOUR FAVORITE PART OF MY STAYCATION? I'll be taking a little break from blogging while I'm in CA on vacation to celebrate my good friend Stephanie's wedding!!!! Don't forget to enter to win a $500 gift card to Tory Burch! Welcome back to my staycation recaps! Make sure you read about Day 1 and Day 2 as well. On this day Rachel and I had planned to go to Newport. But seeing that we were up until 3 AM the night before and the forecast for rain we changed our plans. 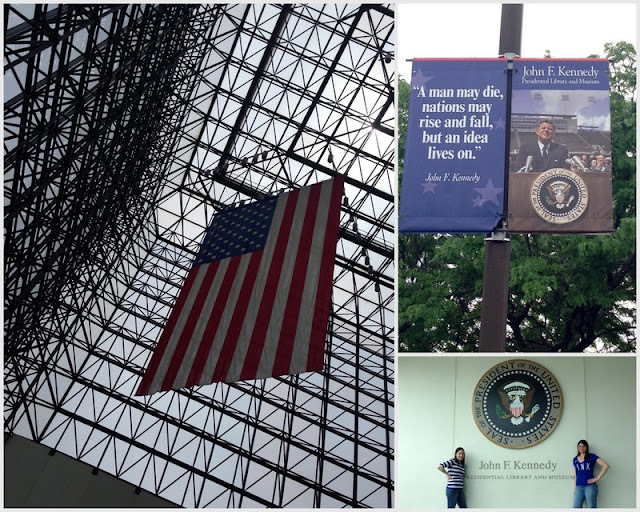 We slept in and then went to the JFK Presidential Library and Museum since it was inside and the weather was suppose to clear by the afternoon. 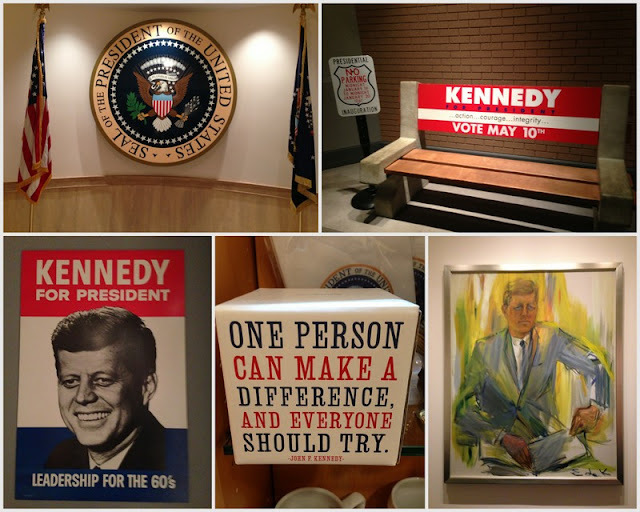 The museum is very interesting and has a lot of memorabilia from when JFK was in office. You do a self-guided tour and basically just walk through and read or watch short videos. I honestly didn't know much about our 35th President so it was really interesting to learn more about his time in office. At the age of 43 he was the youngest man to ever be elected president. He was also the first Catholic elected. He is also responsible for creating the Peace Corps! Some of Jackie's clothes are there too. She has always been know as a fashion icon and this dress is gorgeous! Did you know Jackie was only 31 years old when JFK took office? Also she gave birth to John Jr just weeks later. I can't even imagine being the first lady at all let alone at such a young age! Crazy! 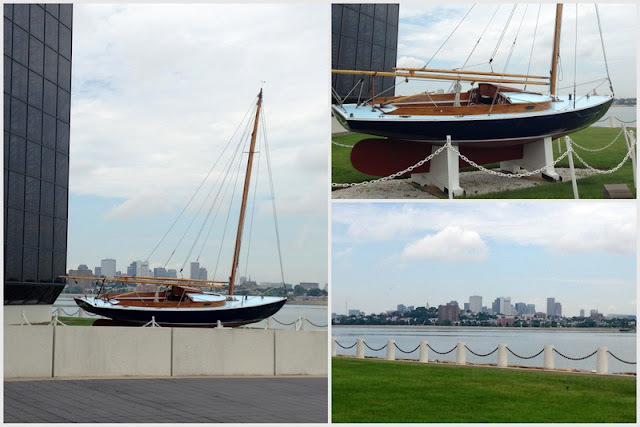 Outside of the museum you can view one of JFK's boats. Oh and it was perfect timing for the sun to come out! All the rain had cleared away and it was shaping up to be a beautiful day! We one more quick stop right across the parking lot at the Commonwealth Museum. 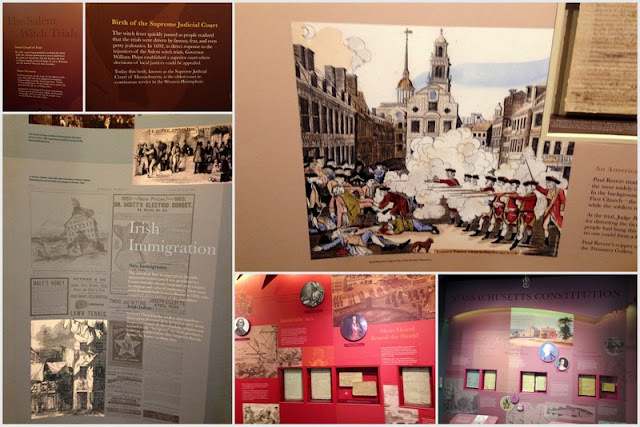 This is a free museum about Massachusetts history and holds several original documents including the Constitution from the Commonwealth of Massachusetts from 1780. It is authored by John Adams and still is the oldest written constitution still functioning as a foundation for government. We were all "museumed" out (yes I just made up a word - who cares!) and so hungry. 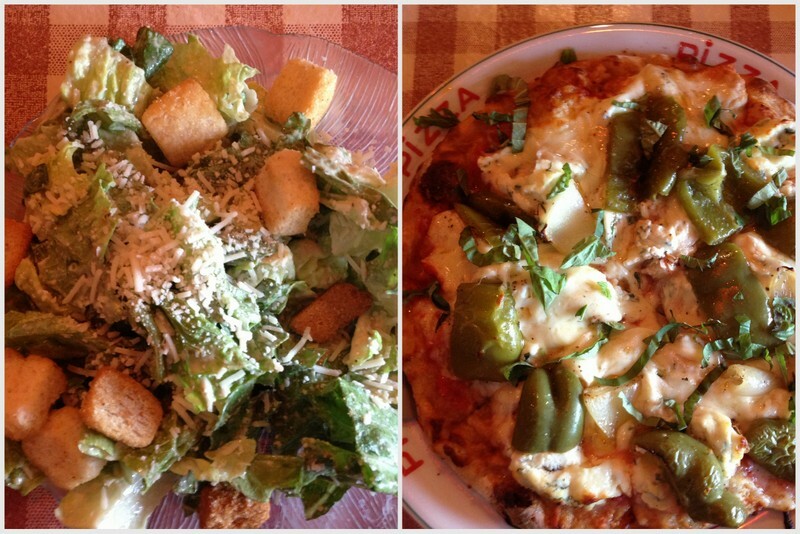 We were able to grab a quick lunch at Pizzeria Regina known for Boston's best pizza since 1926. I figured we would keep going w/ the history lesson and even eat someplace w/ historical value! Ha! 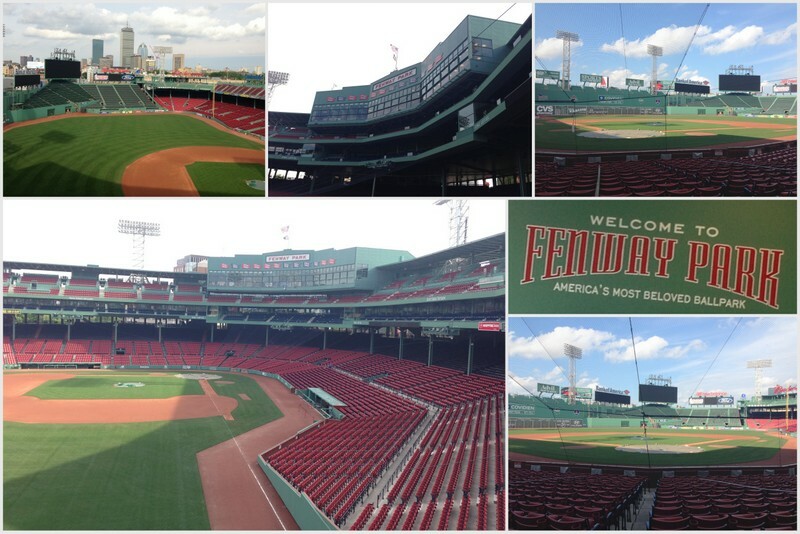 Our last stop for the day was at Fenway Park. 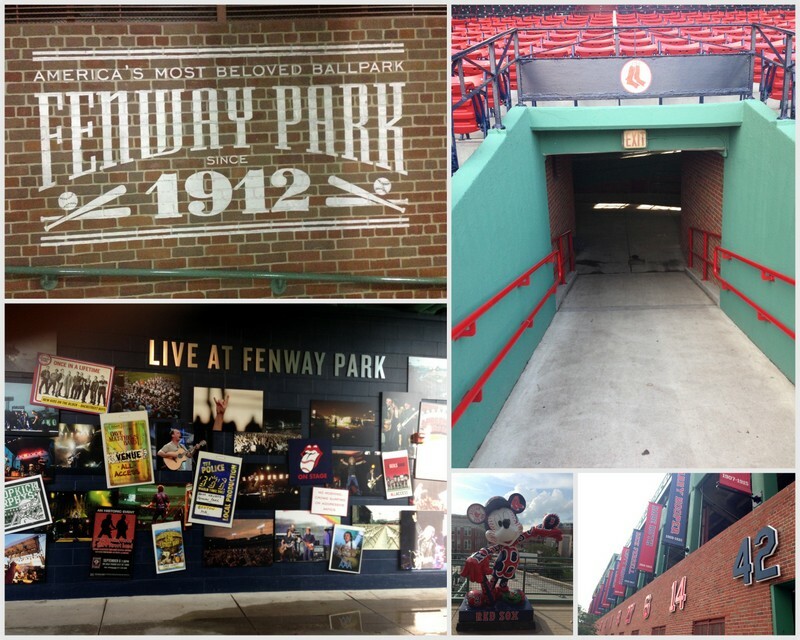 You can't come to Boston without taking a tour of the oldest ballpark! There is just as much to look at outside of the park as there is inside! So if you ever visit make sure you walk around the entire perimeter or the park! 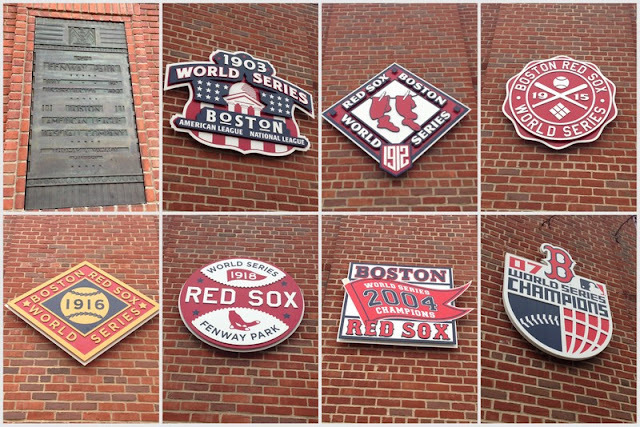 Since 1912 the Red Sox have won 7 World Series with 5 of those coming in the first 15 years of the team's existence. Then then took a little break from winning to give some other teams a chance to win. . . yeah something like that! Finally in 2004 the curse of the bambino was over and the Red Sox won! Then again in 2007 just to keep the fun times going. 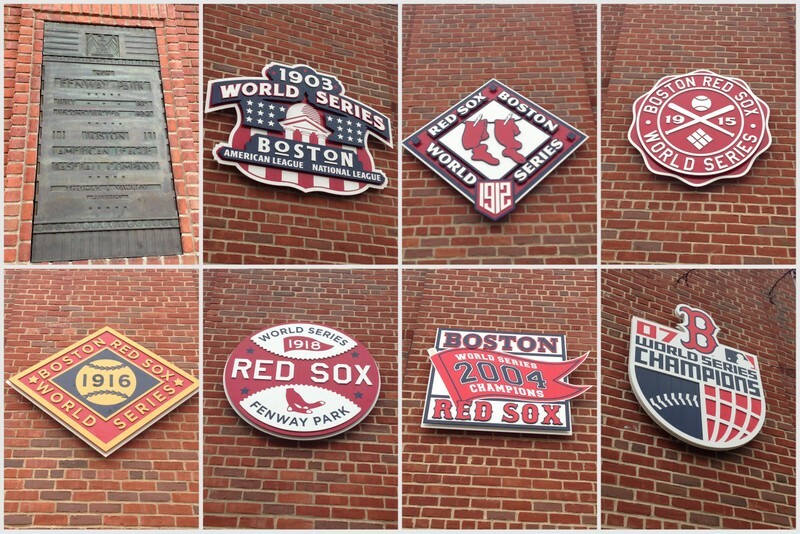 We're hoping for another World Series title to add to the list. . . maybe this year?! 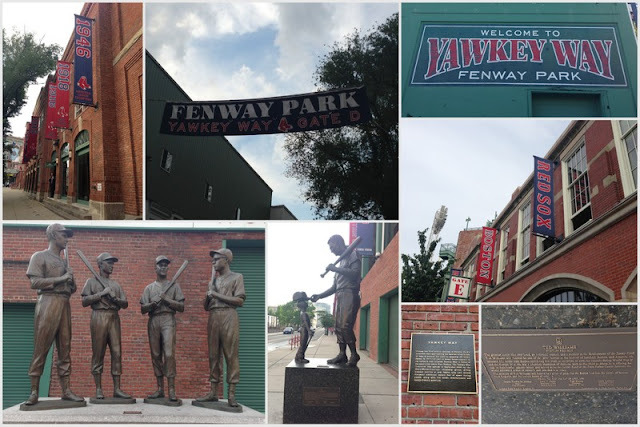 Fenway is a beautiful ballpark with so much charm that you don't see in the little parks being built. But the trade off is that it is small and very little leg room! The views from wherever you sit are great because you really are pretty close no matter what! 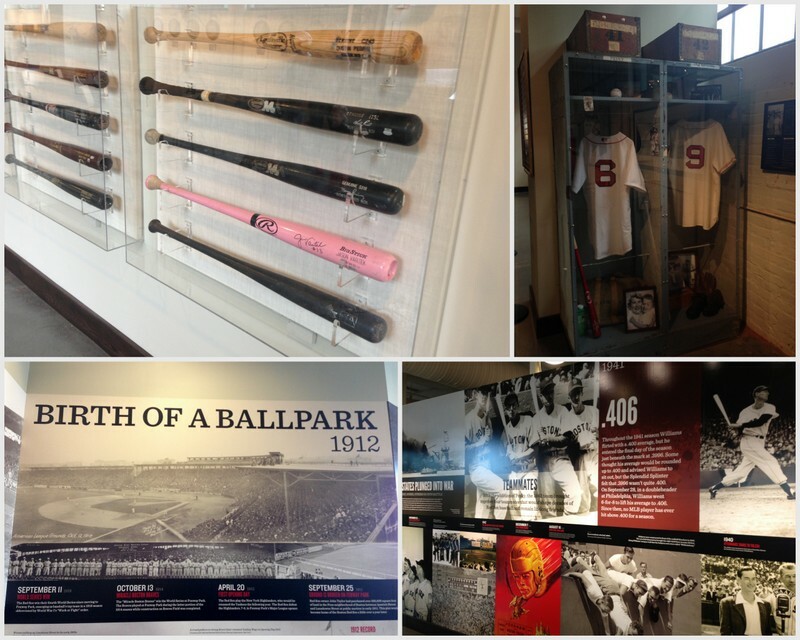 On the tour you get to go to pretty much every area of the ballpark (except the locker rooms). It is fun to see what it is like to sit in each section of the park since I pretty much always sit in the bleachers (the green seats in the outfield). Like I mentioned the leg room is tight especially in the famous blue wooden seats. 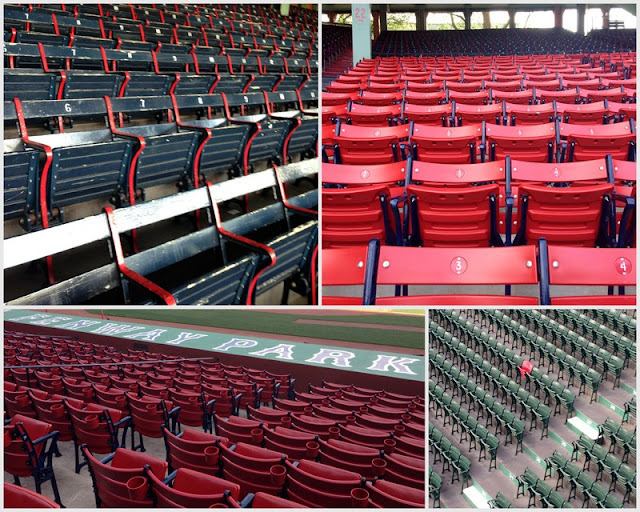 Fenway is the only ballpark to still have wooden seats so I guess that is why they keep them. That and the fact is that if they put in new "normal" sized seats they would lose a lot of seats which means a lot of money! So if you ever visit Fenway for a game don't sit in the grandstands if you have long legs! Oh and I bet you are wondering what the red seat in the mix of all the green seats is?! That is where Ted Williams hit the longest home run ever in Fenway - 506 feet to be exact. He was known for hitting home runs to the bleachers and to commemorate him this seat was painted red! Fenway has also hosted many great live concerts. I had the opportunity to see Dave Matthews Band there a few years back. This summer Jason Aldean, Justin Timberlake and Paul McCarthy are all coming (separately of course). The tour ends in a room that is used for events. The room has memorabilia and historical facts painted on the walls. I had been in this room before for Christmas at Fenway. Oh and this is when they show you the picture they took of you at the start of the tour. It is all printed and in a fancy little cardboard holder. They try to get you to pay $35 bucks for it. WHAT?! Crazy! If they already printed it why not sell it for a cheaper price and maybe people would actually buy them!!?? We had a great time on the tour. I highly recommend it if you ever come to Boston! After the tour we went home and pretty much crashed. We were exhausted from the busy days of sightseeing. We went to bed early so we could squeeze in a visit to Newport the next day before going to the Red Sox vs Rangers game. Stay tune for my final recap!! !